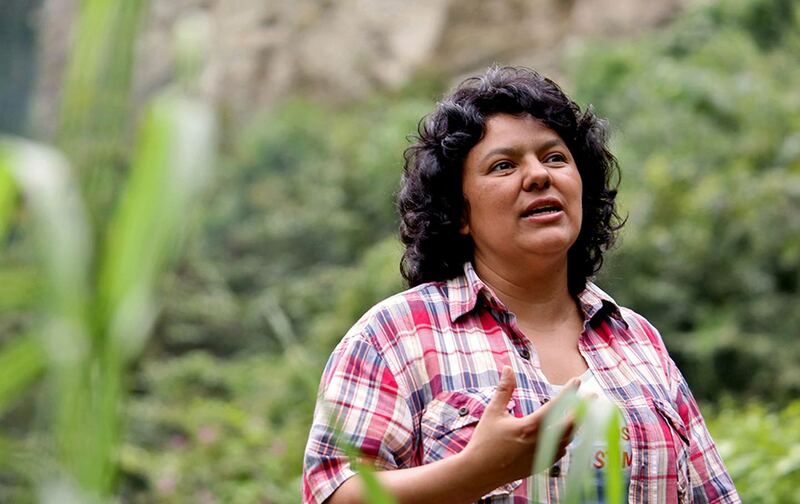 Berta Cáceres was murdered in her home on March 3, 2016. She was a prominent environmental activist, protector of indigenous rights for the Lenca people, and co-founder of Council of Popular and Indigenous Organizations of Honduras (COPINH). She was not the first to be murdered for her beliefs. And sadly, it isn't likely that she'll be the last. Since the 2009 coup d'etat at least 100 environmental activists have been murdered in Honduras, making it one of the most deadly places to be an environmental activist. This figure may be deceptively low due to under reporting of murders because many work and live in remote areas, making it easier to avoid public scrutiny. Since 2009, right wing governments have promoted investment in mining, agri-business and energy infrastructure projects. An ever increasing demand for beef, soy, and timber fuels this demand, however these projects conflict with indigenous rights and violate international law. The data collected on the murders of environmentalists increasingly shows that women and indigenous peoples lives are at greater risk. On 7 July, another activist of COPINH Lesbia Yaneth Urquia's body was found. COPINH's website reads, "The death of Lesbia Yaneth is a political femicide that tried to silence the voices of women with courage and the bravery to defend their rights." Her death comes shortly after the Guardian's story citing a kill list for environmental activists; which was distributed among US trained Special Forces units of the Honduran military. In May, four arrests were made in connection with Cáceres murder after increasingly international outcry and public scrutiny. Berta Cáceres and COPINH have had a leading hand in protesting against mining and putting a stop to the Agua Zarca dam on the Gualcarque River, which is considered sacred to indigenous people. 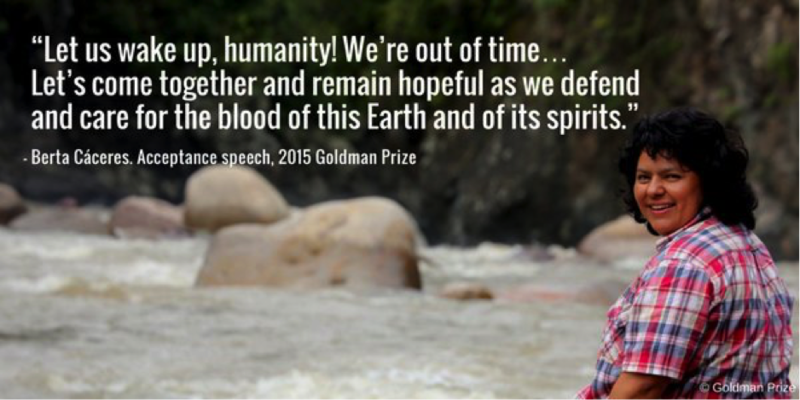 Last year, she was awarded the Goldman Environmental Prize recognizing her grassroots efforts. Since Cáceres murder international pressure has mounted against the Honduran government to take action to protect activists and uphold indigenous rights. Human rights groups have also turned to the U.S. condemning their support for Honduran security forces amid the growing evidence of systemic abuses by officials. The COPINH and other international groups are concerned that the government is not doing enough to protect indigenous activist. The Public Ministry has stated they will form a special commission to investigate Urquia's murder, but environmental activist lives are increasingly at risk as they clash with companies, gangs and their own governments. Bridget Otto is a recent graduate of International Relations, where she specialised in resource security. In her spare time she can usually be found planning her next adventure.